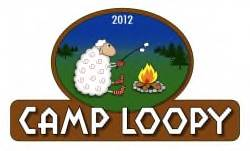 Yes it’s a Camp Loopy Progress report. I’ve been knitting like a mad woman on my scarf – not because I’m afraid I won’t get it done in time but because it’s fun to work on and I absolutely LOVE how it’s turning out in the yarns I’m using. 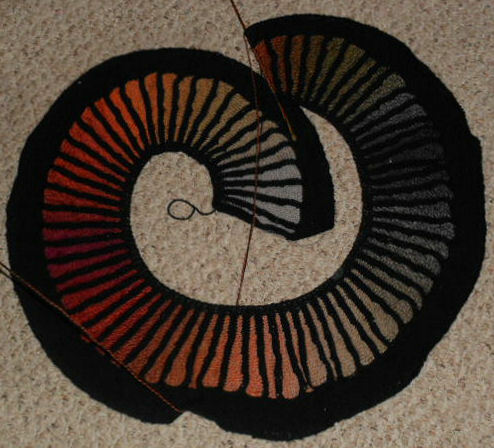 When I got to the second area where there’s a lot of gray shades, I did break the yarn, take out some of the gray, and restart farther towards the end of the gray because I wanted to get back to more brighter colors. I’m already wondering what might be ahead for the next Camp Loopy project but will have to wait till the end of the month to find out. And if that wasn’t enough knitting – that purple and multicolored sock yarn I posted a photo of a couple days ago — well I’ve been knitting on those socks on the bus ride to and from work the last couple days and here’s where I am on those — I like the way this yarn is knitting up. 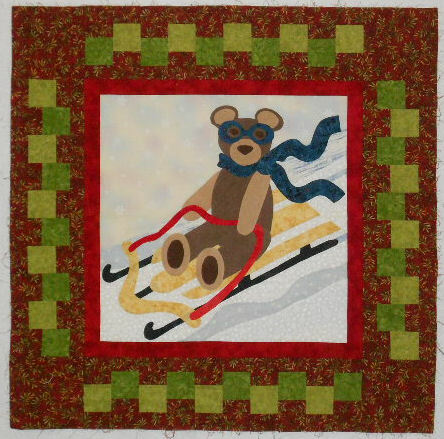 I added the final border and then quilted and bound it. 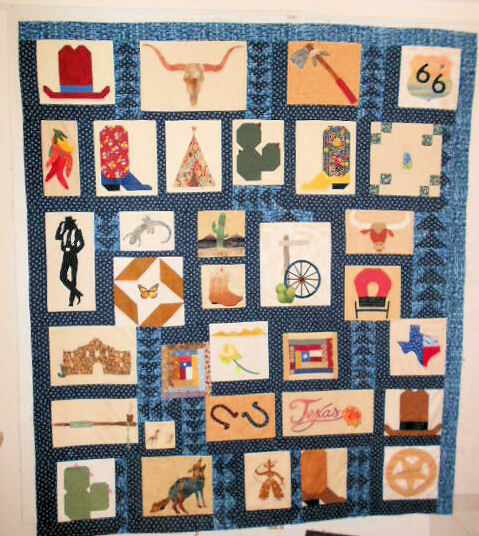 February was #1 – the Texas Hill Country quilt. 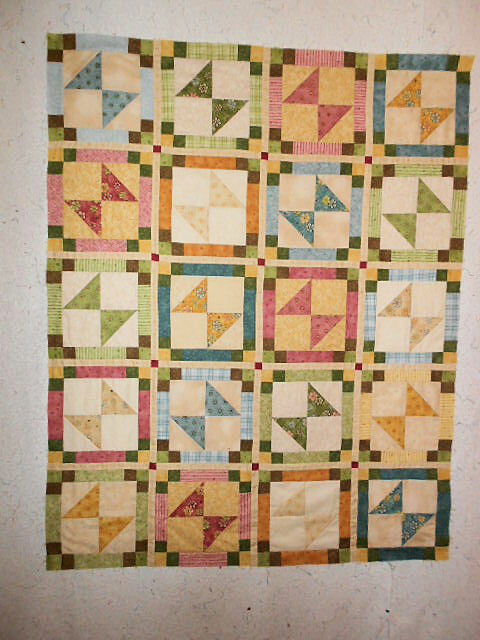 — Needs to be quilted and I haven’t started on it yet. Then March was number 8 – Just Butterflies. and quilted it. The binding is sewn on the edge but it hasn’t been pinned to the back or hand stitched yet. That will get done one of these evenings. April – #10 – Prairie flowers — this is where I messed up on my number so nothing has been done yet. 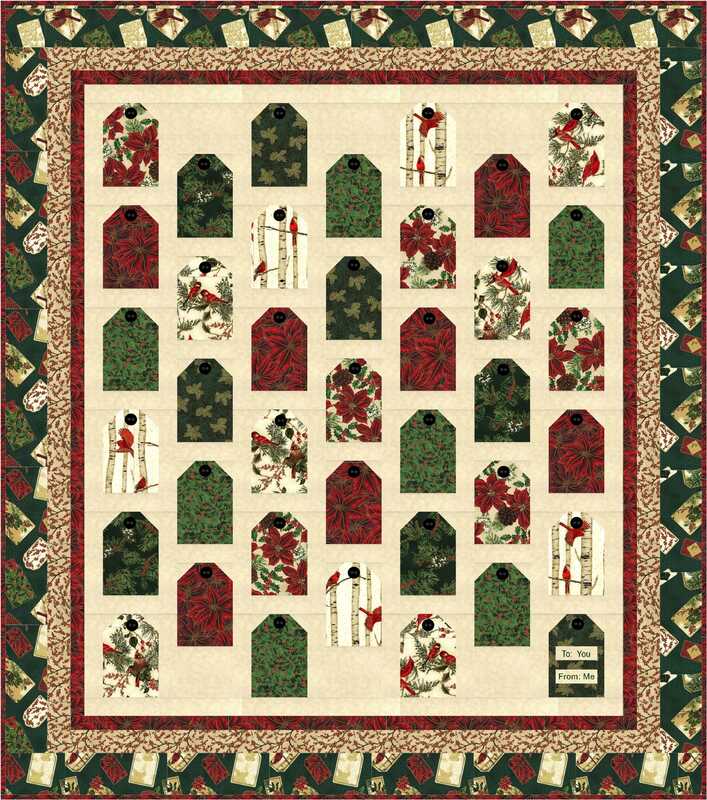 I still want to find the right fabric to add a final border on this one. 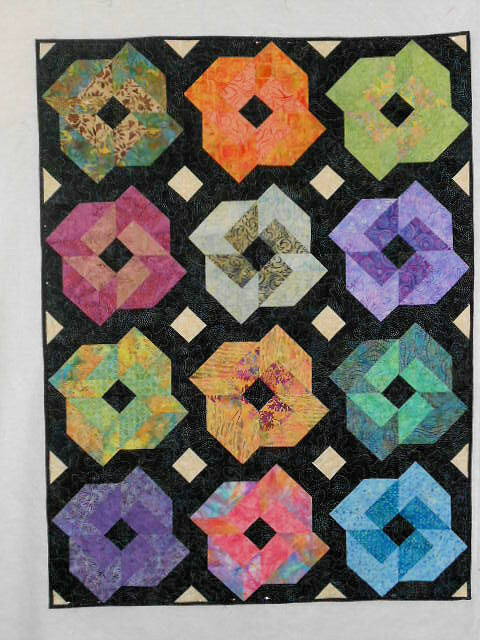 May was Pinwheel Posy — It just needed to be quilted and I did that in the last week or so too so that one is quilted and bound and done! 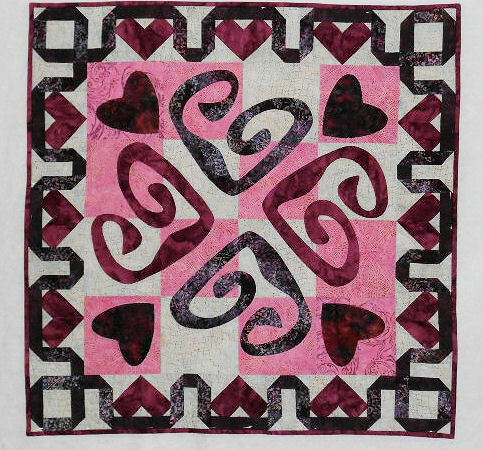 And then there’s number 12 for June – Wacky Hearts – which I quilted a couple weeks ago and got the binding done so it’s already finished. 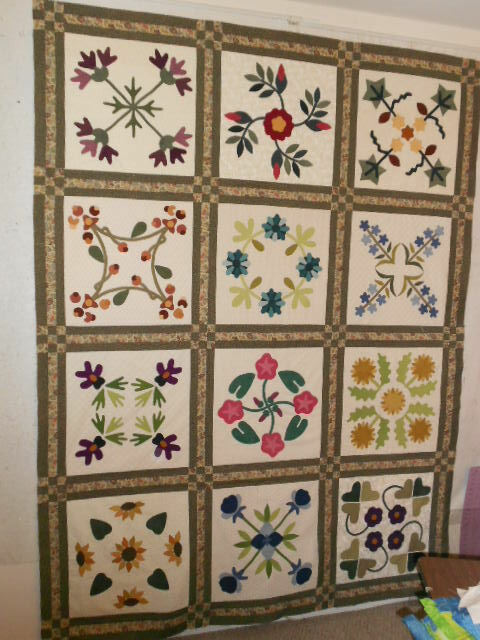 So now I’ll have to go back and work on the Texas quilt – but need to restock the batting supply first since there’s only smaller pieces left — and take Prairie Flowers to the quilt shop to see if I can find some border fabric for it. 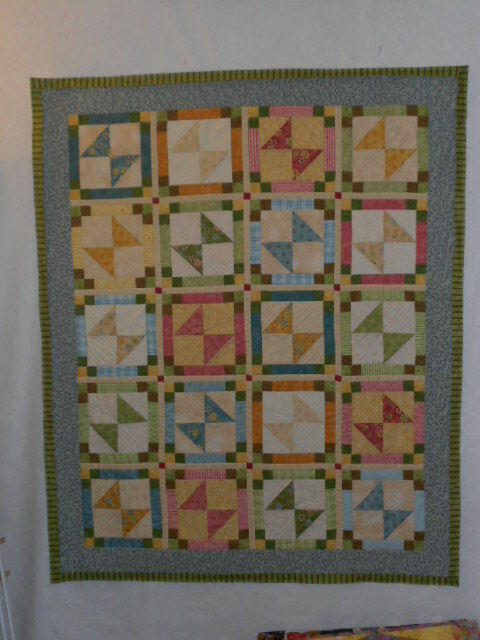 is now quilted, the green stripe binding is attached but not pinned to the back yet. Ran an errand, made some choc. chip cookies and a bowl of cold tuna pasta salad so I have something for lunch tomorrow. Made quite a bit more progress on my Camp Loopy scarf which is looking lovely but I haven’t taken a new photo of it yet. Also need to start a new pair of socks but can’t decide what pattern I want to use. 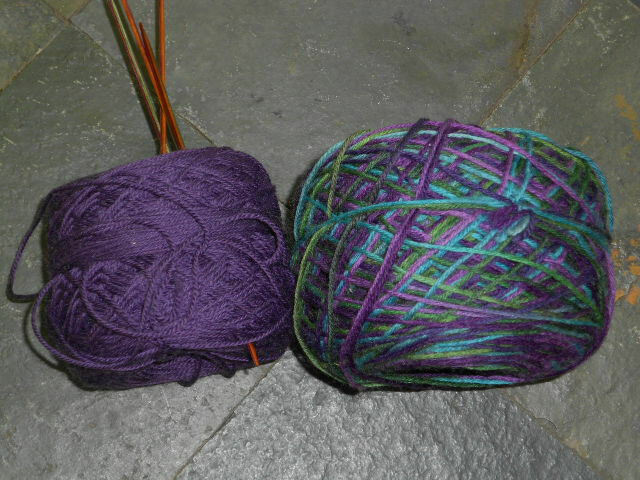 But I did find these two yarns laying side by side in one of the plastic tubs. They look like I specifically bought them to go together but I don’t think that was case. 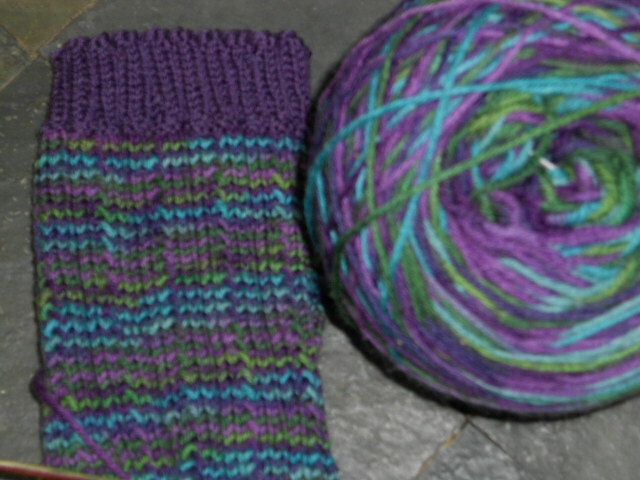 But I think I will be making some socks with the solid color for the heels and toes. But time to go relax for a while with a latte and flip through a few sock book patterns to see if I want to try a new pattern or use some tried and true pattern I know I like. I’m off to a slow start this morning putzing with things here and there. But I’m about to head into the sewing room to see if I can’t get the quilting done on Just Butterflies. 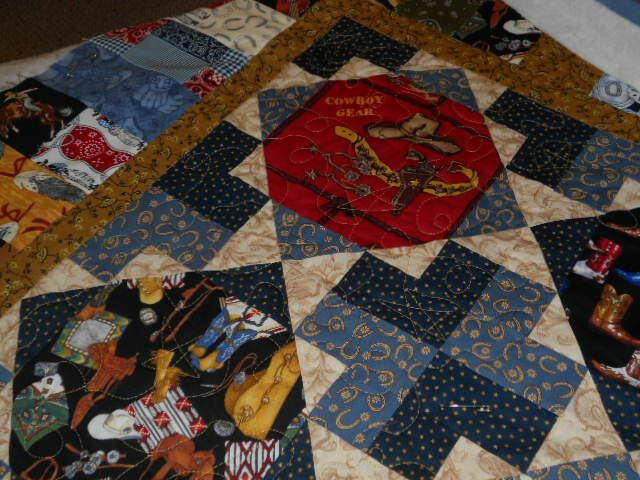 In the meantime, finished the binding on the western fabric quilt so it’s all done and headed to the quilt donation pile. The design at left is one I’m still playing with – Twisted Star – it’s sort of a spin off (no pun intended) of my Pinwheel Posey design. Yesterday as another busy quilting day. 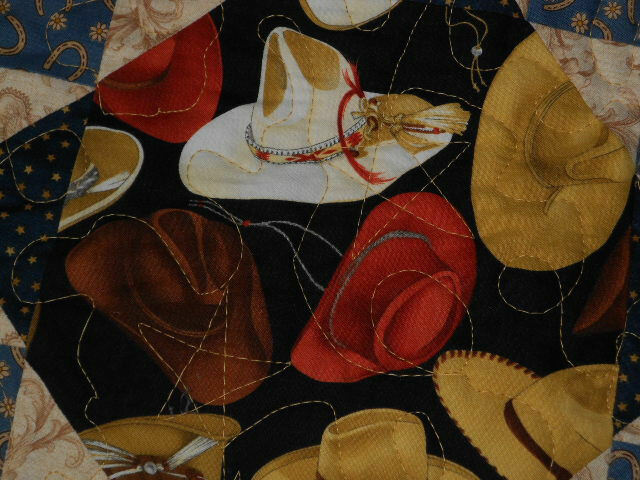 I completed the quilting on the western themed fabric lap quilt, made the binding and added that. I still have to hand stitch the binding down but here’s what it looks like (it actually is a square quilt but I had to stick two pins in the upper corners to get it to stay on the design wall so it looks off kilter). Yes – there are a whole lot of western and Texas themed fabrics in that quilt — way more scrappy looking than I usually do but I wanted to use all those fat quarters we swapped together. It will be a donation quilt for a charity when it’s done. Center part is just meandered with stars and loops. I’ll save the binding to stitch one of these nights so think today I’ll pull about another one to get layered and ready to quilt. 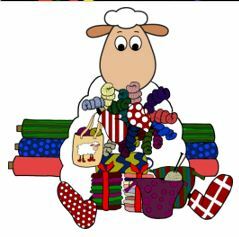 I may also need to do a little bit of baking today – my freezer seems to be overrun again by bananas — banana bread, cake, muffins – don’t know what it will be yet but need to get some of those bananas made into something. 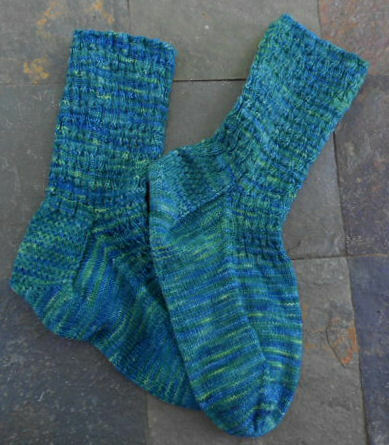 I also managed to finally finish off another pair of socks last night. Here’s a corner of the quit top I pulled out of the crate to work on today. 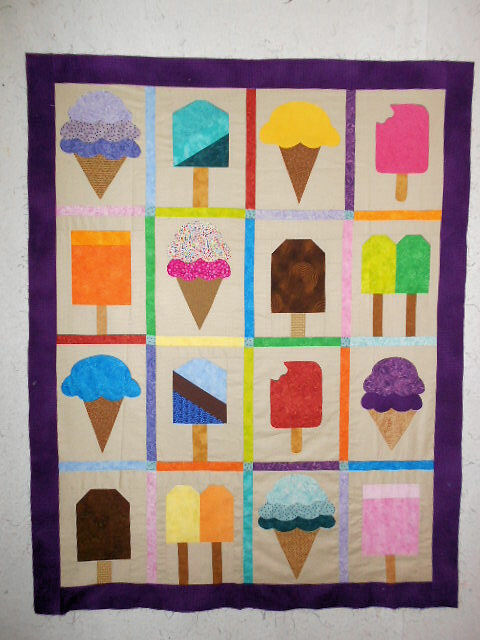 This is just a largish lap quilt size that will be a charitable donation quilt. 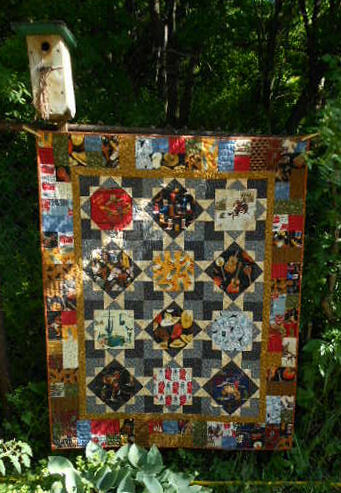 It is made from fabrics that were swapped while attending a Romp in Texas Hill Country – a TQP retreat at the T Bar M Ranch, New Braunfels, Texas. One of the swapw we did there was a fat quarter swap of Texas and western themed fabrics so I cut them up to make this scrappy quilt. I pulled together a couple pieces of blue fabrics to make the backing – one being the horeshoe and flower print used in the quilt blocks – and pieced a backing for it and got it layered this morning. 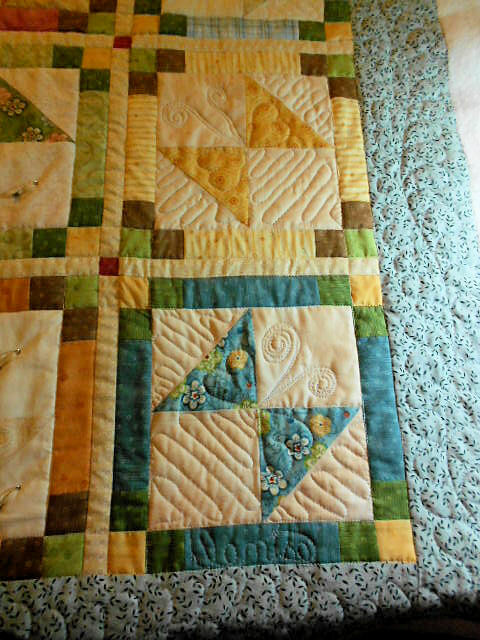 I’ve now got about a quarter of the center of the top quilted and the gold border stitched in the ditch. 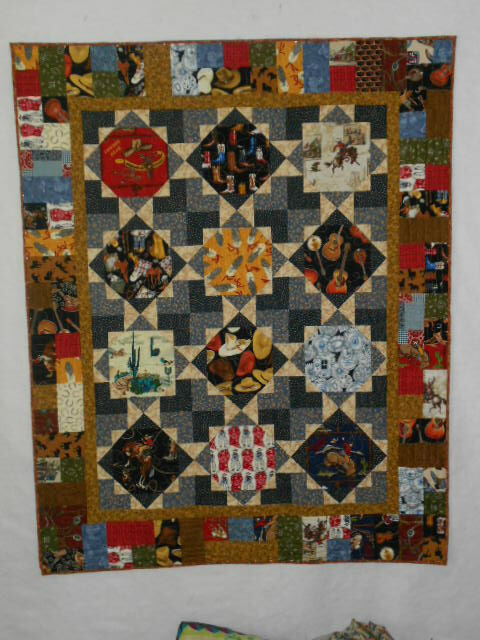 The center is just quilted with meandering loops and stars in a gold thread. Hmmm… can I get this one all quilted and binding attached so I can hand stitch on it tonight? Maybe, I don’t know for certain…. but I do know for certain that it’s way past lunch time and I’m hungry so time for a break! First – Pinwheel Posey is is finally completed – binding finished and all. Not only was it my May UFO Challenge project but it is also one of the Quilts from the Crate so now I’ve got I think 5 of the tops from that crate pulled out and finished — tho many more to go. Only 1/2 yard used this week for binding so 30 yarrds purchased YTD; 41.75 used; net busted 10.75. 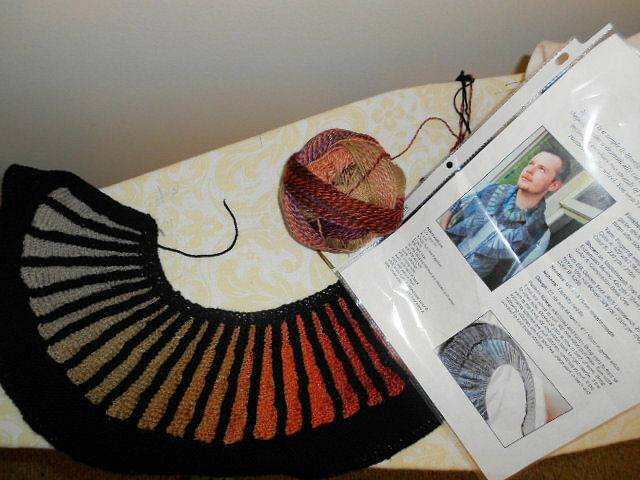 I wasn’t sure if my choice of Zauberball yarn would look good in the scarf – I was afraid the transition from color to color would be more abrupt but as you can see in the scarf photo – it’s turning out so pretty. As it transitions to the next shade, both colors are twisted together for a while so it moves gradually from shade to shade. I absolutely love it. 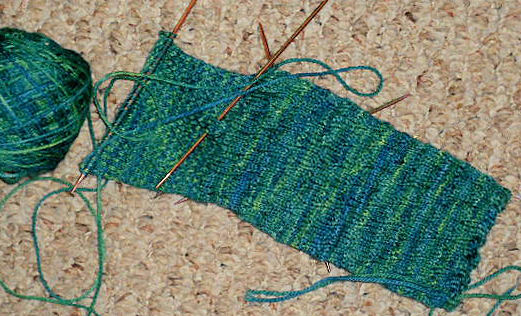 Although I didn’t take a photo of it – the sock I posted yesterday that I was ready to turn the heel on ….. the heel is turned, the decreases all done, and I’m on what I consider the “straightaway” the main part of the foot which just plain old knitting until I get to the toe decreases. I love it when I get to that point, you know you in the home stretch. I should easily get this pair finished before the end of the month but tonight (well actually tomorrow at 12:01 a.m.) is the official start of Camp Loopy and we can start on our first project. You KNOW I will be up knitting at that time and probably straight on through the late late late movie and into the morning news! 🙂 I usually stay up till midnight on week nights but on the weekends – and especially since I’m on vacation – I stay up much later. I’m really anxious to see how the yarn I got works for the wedges in the Spectra scarf. 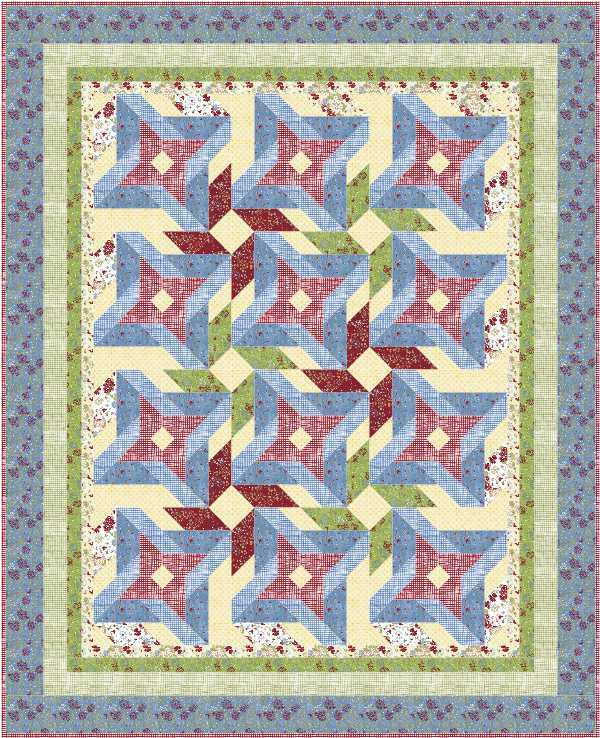 The Pinwheel Posey quilt I posted a photo of yesterday …. that two has made great progress. 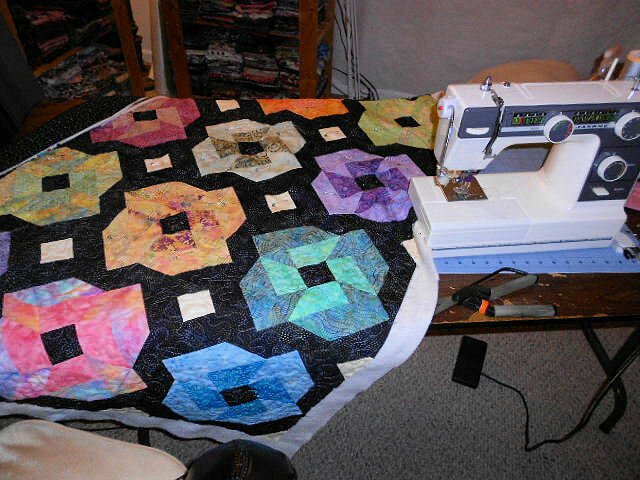 The quilting is finished, the binding is attached and I’ve got it probably half hand stitched down this afternoon. So I’ll get that finished off tonight I think. Here it is with the binding pinned on and just kind of stuck to the design wall — the weight of it meant I had to snap a quick photo before it decided to fall off the wall. Tomorrow I’ll decide what will get layered to quilt next. Plenty to choose from. That’s what today has been for me. Some cleaning, several loads of laundry, I pulled yarn from the various containers it was stored in to consolidate it into the under the bed roller storage containers I got. I still have a basket or two to go through but that is mostly scarves and socks in progress that needs to be straighted out so they will go in a smaller storage tub with their pattern so I don’t lose it or use the yarn for something else thinking it is leftovers. And then there’s a box of needles, stitchholders, stitch markers and who knows what other little gadgets that need to find a home and be sorted out. Also made some progress on the current sock. I now have the heel flap made and I’m ready to turn it. I was hoping to get this one done before Camp Loopy started (sunday night at midnight) but don’t know if that will happen. My project is all ready for Camp Loopy so I can begin knitting like the wind to get that scarf done but it should go pretty quickly. And as I’m on vacation (and it’s the Monday holiday anyway) I could start knitting at the stroke of midnight on Sunday night if I wanted. There was also a bit of quilting. 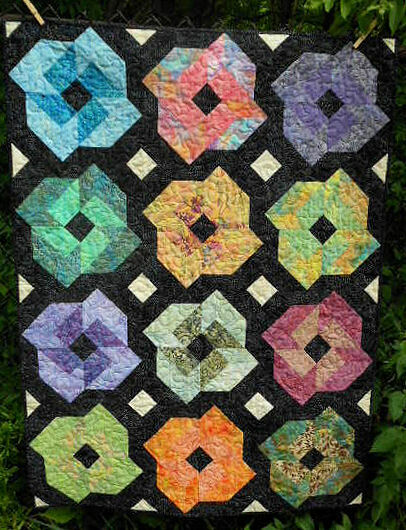 I couldn’t decide how I wanted to quilt Pinwheel Poseys so just did a meander in light gray thread (which is one of the colors in the black background fabric). I’ve only got about a quarter of it left to do. So if all goes according to plan, tomorrow I’ll be attaching the binding and get it finished off before the end of the month.